We were up at 5.30 and on the road in 20 minutes but the executive considers that we still wasted 20 minutes of daylight so we may be getting up before we go to bed by the end of the trip. We enjoyed our cool morning ride through Dambulla (the market had cleared all the produce from yesterday) and on south towards Matale. 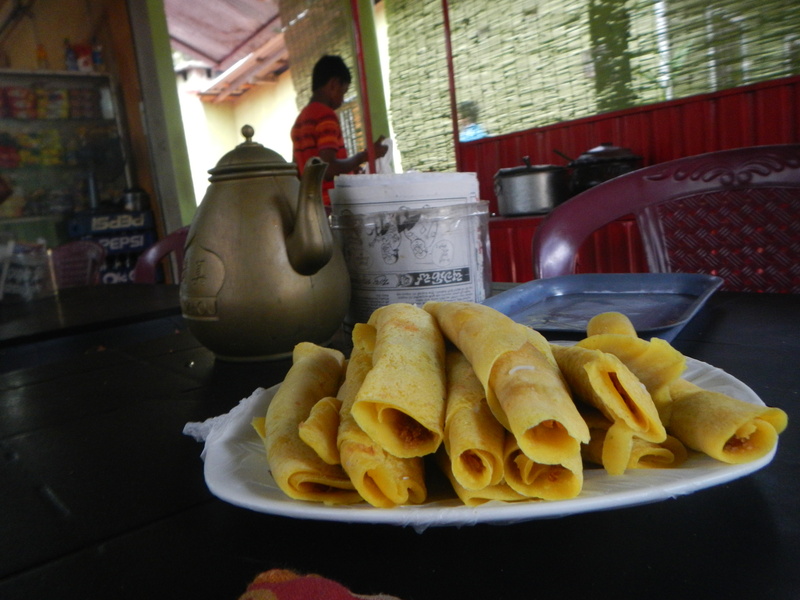 We had sweet pancakes and string hoppers at a roadside stall for breakfast. The riding conditions weren’t so favourable today with heavy traffic, narrow road and no shoulder. Hair-raising overtaking was commonplace but somehow no crashes. Drivers are clearly expecting close shaves and we’re coming to that position also. Fortunately, vehicle speeds are low. It must be quite frustrating driving any distance. We made the mandatory visit to a spice/herb garden so now we can deflect all the other spice/herb garden touts. It was interesting to see nutmeg, cinnamon, pepper, vanilla and many more common spices in their native state. Our guide was didactic and I fear we were poor students, talking amongst ourselves, not waiting for his explanations and ultimately rejecting his recommended therapies. It transpires that these establishments are offering Ayurvedic treatments to cure all our ails. No chemicals and government-endorsed, of course. We got out in the nick of time with only a bald patch on my calf to attest to the effectiveness of their herbal depilatory cream. We had some difficulty finding our hotel, quaintly named Dad’s Holiday Home, at 91/1 IDH Road, Matale – an address that Google Maps struggled with. We found it eventually set on a dirt track, off a side road, in a rustic village on the outskirts of town. It’s very nice in a pleasant quiet location with splendid views to high, cloud-veiled mountains nearby. We were just in time to enjoy a couple of tropical cloud bursts without getting drenched. The rain freshened the afternoon and with 300m altitude we’re enjoying pleasant conditions. After a snooze we took a tuk tuk into town looking for action and lunch. We were a bit late (3pm) but the driver found somewhere busy and authentic. The roti maker had quite a distinctive 5/8-time rhythmic tattoo as he double-hand chopped roti with vegetables on his hotplate for a signature dish. Matale is a bustling town with a well-defined CBD stretching several blocks, a one-way street system and an extensive market. 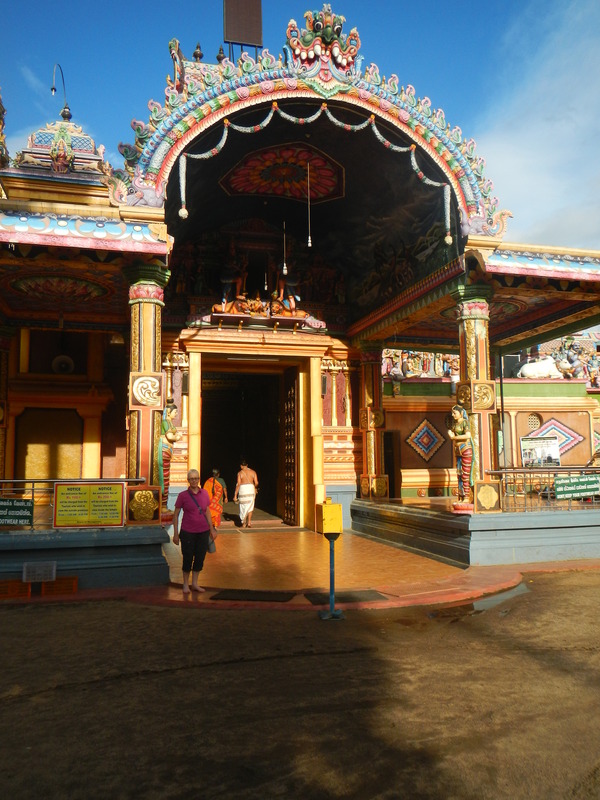 We visited the Sri Muthamariamman Hindu temple and then made our way back to Dad’s for a beer and dinner. We have enjoyed at a distance the demise of our unpleasant Prime Minister. 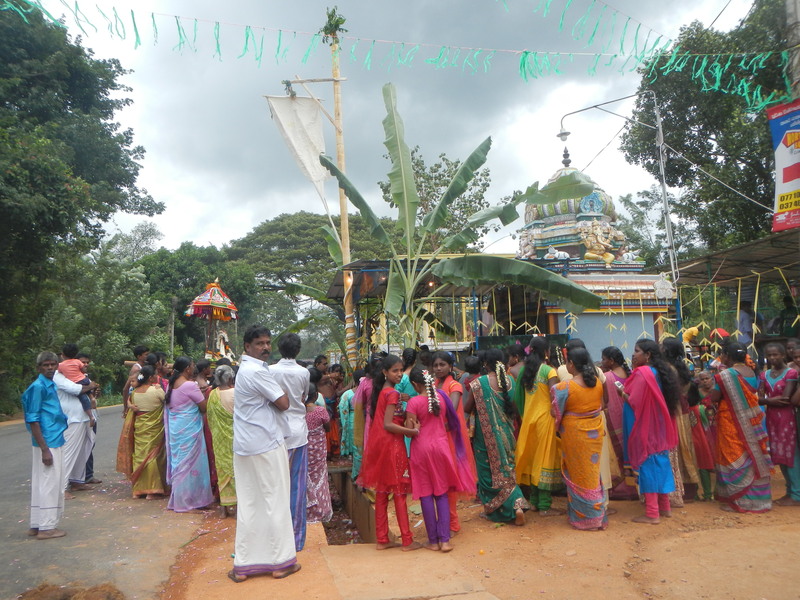 This entry was posted on 14 September 2015 at 12:22 pm and is filed under Sri Lanka. You can follow any responses to this entry through the RSS 2.0 feed. You can leave a response, or trackback from your own site.